Food poisoning is categorized as a foodborne illness that is caused by consuming food contaminated with infectious organisms. These organisms can include parasites, viruses, and bacteria, or the toxins they excrete. The food can become contaminated at any point of the growing, manufacturing, processing, or cooking. While the organism might be present in the food, it is not killed off by proper handling or cooking. An individual suffering from food poisoning can begin having symptoms within hours after consuming contaminated, toxic, or spoiled foods and will experience severe diarrhea, vomiting, and/or nausea. Mild cases tend to resolve on their own without the need of medical treatment. However, severe cases will require immediate medical attention at an emergency facility. Every year, at least one in six individuals in the United States will contract food poisoning from consuming foods that harbor harmful agents. These foods can include soft cheeses, unpasteurized juice or milk, raw eggs, undercooked or raw seafood and/or meat. In addition, fresh produce that has been improperly handled or grown in toxic environments can be problematic, as can food that is sold in bulk. One contaminated food product available in an open buffet can affect any and all neighboring foods. Individuals can create a toxic environment where food becomes contaminated at home if their hands or the cutting board is not properly washed when preparing different foods. Who Is at Risk for Getting Food Poisoning? The Elderly – Older individuals tend to have a more compromised immune system compared to younger adults and might not have the ability to quickly respond to an infectious organism that contaminated the food. Pregnant Women – Pregnant women deal with changes in their blood flow circulation in metabolism that increases the potential risk of suffering serious side effects associated with food poisoning. Additionally, the body's reaction tends to be increasingly severe while pregnant. However, the baby is usually not affected. Children of All Ages – Children of every age have an underdeveloped immune system that might not be able to ward off many of the complications associated with food poisoning. Individual Suffering a Chronic Disease – Suffering from a chronic condition including aids, liver disease, diabetes or other malady and those receiving radiation of chemotherapy to treat cancer have a heightened risk of suffering the symptoms of food poisoning, due to a compromised immune response. Most individuals who suffer from food poisoning are greatly dehydrated from having lost essential minerals, salt, and water due to constant vomiting and diarrhea. However, this complication can be overcome by drinking adequate supplies of replacement fluids throughout the day. Severe dehydration can be a serious problem for individuals with food poisoning who also have a chronic illness or a suppressed immune system. In many cases, the individual requires hospitalization to ensure they receive adequate fluids intravenously. Without proper rehydration, the patient can quickly die. Listeria Monocytogenes – Pregnant mothers can experience a miscarriage if they suffer food poisoning caused by Listeria. Medical science has correlated Listeria infection to stillbirth, premature birth, or of fatal infection once the child is born. Injury to the newborn can occur even if the mother's symptoms were mild. Newborns who survive a mild to severe Listeria infection often experience delay development due to long-term neurological damage. E. coli (Escherichia coli) – Certain strains of E. coli are known to produce serious complications in males and females known as a hemolytic uremic syndrome that causes considerable damage to the lining of the kidneys' tiny blood vessels. In severe cases, the patient can suffer kidney failure, especially children who are five years and younger and older adults who live with the weakened immune system. It usually takes a few hours after consuming contaminated food before the individual begins experiencing the most common symptoms associated with food poisoning. However, in some instances, the symptoms do not reveal themselves until days or weeks later. The general malaise and discomfort associated with food poisoning typically last for a minimum of a couple hours to more than several days. 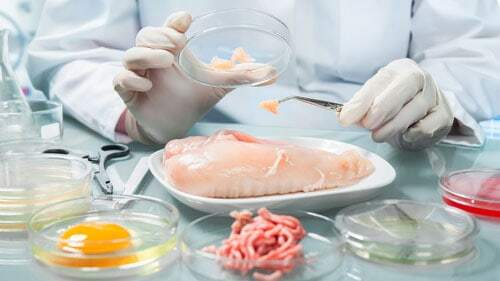 To accurately diagnose food poisoning, the doctor will need to compile a detailed medical and personal history on the patient that includes the length and type of symptoms, the foods that have been consumed and the amount of fluids the patient is taken since the onset of their symptoms. Next, the doctor will usually perform a comprehensive physical examination to look for any indicators associated with dehydration. If needed, the doctor will order diagnostic testing including a stool culture, blood test, and a stool examination to identify parasites that might confirm or rule out an accurate diagnosis for food poisoning. The stool sample is taken and sent to a laboratory or a competent pathologist can look for and identify the exact infectious organism causing the problem. If identified, the doctor typically notifies the area's local health department to see if there is any link to other food poisoning cases that could reveal to an outbreak in the community. Sometimes, accurately diagnosing a case of food poisoning cannot be conclusive because the organism is never identified. Lost Fluid Replacement – Because of extensive vomiting and diarrhea, the patient can easily lose essential electrolytes and fluids and will need to replace calcium, potassium, and sodium to ensure their electrolytes remain balanced in the body. Antibiotics – If the source of the contaminated food is caused by bacteria, the doctor may recommend antibiotics, usually given intravenously during hospitalization. This is especially important when pregnant to prevent the baby from becoming infected. Pepto-Bismol and Imodium AD might provide some comfort by relieving some of the symptoms associated food poisoning with fevers and diarrhea.